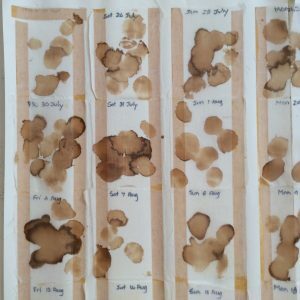 It’s been a couple of months since I gave an update on the Teabag Diary project. I now have 4 months worth of dried teabags and 6 jars of dried tea. These were collected from our tea-drinking at home, at the studio and also when camping. Today I was able to get my original Teabag Diary (1999) out of storage and take some photographs of it. The piece(s) is very fragile. It is also a lot smaller than in my memory. I thought it was quite a project at the time of doing it. I can now see that it was a ‘good start’ but needed progressing further. Seventeen years later is rather a wait, but I am happy to have embarked on a new Teabag Diary: ‘A Year of Drinking Tea’. 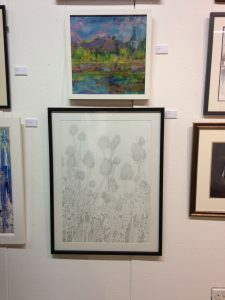 I shall soon be trying to find a suitable location to display the work(s). To return to my original tea bag diary, I was disappointed at how the double sided tape had discoloured so badly. 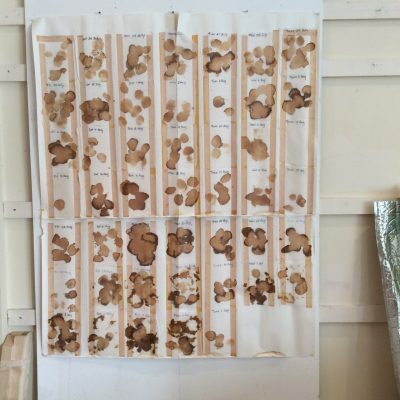 On a positive note at least the staining does not clash with the tea stains – rather they may enhance them. Lesson learned on using the wrong materials however! I also used masking tape to join the sheets of backing paper. Why on earth did I not find some suitably sized paper in the first place? I have executed a couple of small repairs just to hold the sheets in place but I need some advice on how I can preserve the work for the future. It is interesting to note that both projects are about ‘time’. 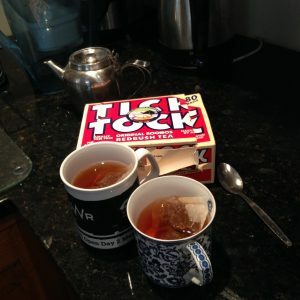 The diaries create a record of how much tea we drank in a day (for the 1999 diary) and by the month in the current diary. 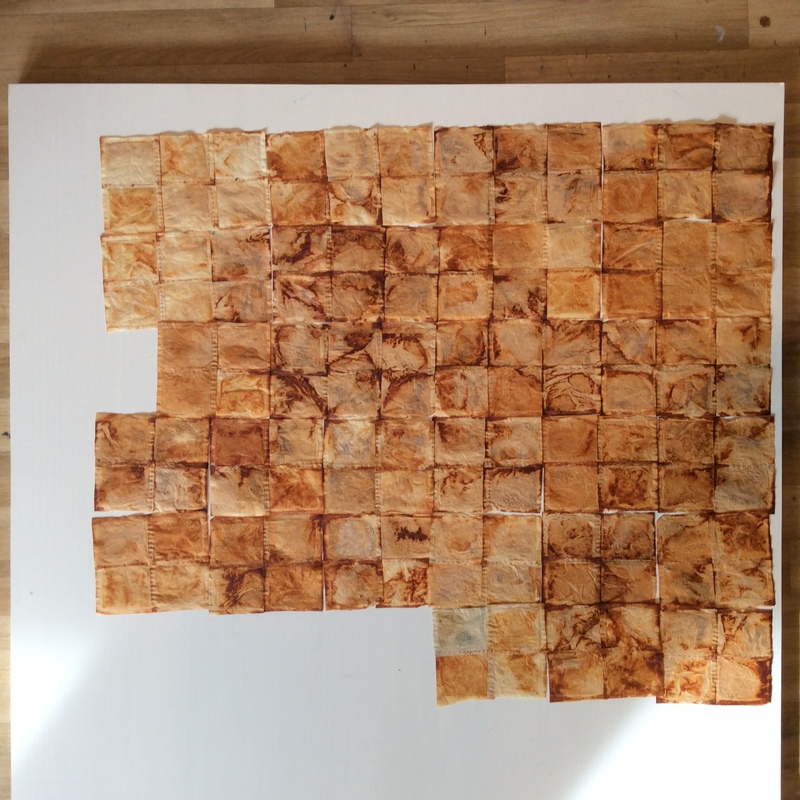 As I am in the process of packing up my Lavant Studio, I am keeping my stitched teabags as modules of 2, 4 and 6. This means that they can still be stored flat very easily and won’t be damaged. I laid out the modules which have been stitched already onto a board to get an idea of how much more I might need to do and to see the impact that the teabags make. Not all bags are exactly the same size so the piecing of the teabags will be quite tricky for the final piece. 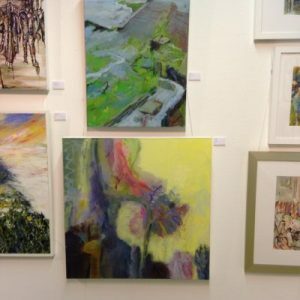 The teabag diary does not replace my painting and drawing practice, but sits alongside it. It is not my first venture into recording the waste products of daily domestic life. 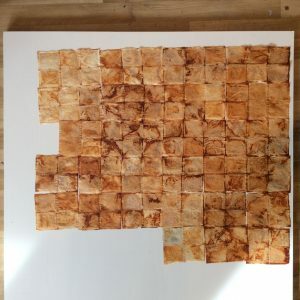 I have also unearthed a series of photos the I took on a daily basis (probably 2004) of the waste peelings and probably teabags from my daily food preparation. Yet again, the work is about the passage of time and the evidence of the household consumption. We were a bigger household then, with two daughters living at home too. 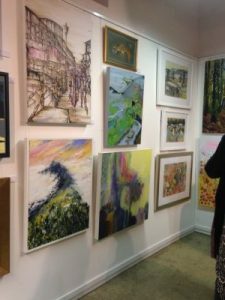 This is the Private View for the Stride Open Competition 2016. the bottom painting is my oil painting ‘Janus Light’.
. This is the second time that I have been shortlisted for this competition. Congratulations to friends Gemma Green, who had a drawing on display and Krysia Drury, who won second prize for painting.